Nintendo’s latest console, the Nintendo Switch, is all set for a debut this coming March 3rd. Are you ready for what’s coming? Surely this hybrid console is set to blaze new trails to say the least, and with every console release, you can be sure that there will be a fair share of accessories that are set to follow. SteelSeries knows this, which is why they have come up with the SteelSeries Arctis 3 headset that is specially meant for the Nintendo Switch. 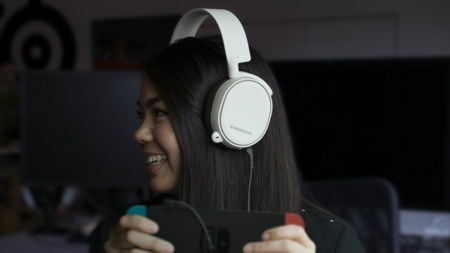 The SteelSeries Arctis 3 is an all-platform headset (not confined just for the Switch, but it does seem to be well suited for the upcoming Nintendo console) that will be able to deliver high-quality sound and next-generation style for gamers on-the-go. Being one of the major PC gaming headset brands in the US, Nintendo Switch owners will definitely be able to look forward to a fantastic portable gaming experience. The Arctis 3 sports design-forward thinking as well as being the best audio choice when it comes to all-platform gaming. Not only that, this particular analog wired headset will also be fully compatible with PC, Mac, Xbox, PlayStation, VR and mobile devices, which means it would be $79.99 well spent. After all, having fantastic audio quality is one thing — the other important aspect would be how it looks like while you are wearing it, and we are glad to say that the SteelSeries Arctis 3 does not disappoint at all in the looks department.